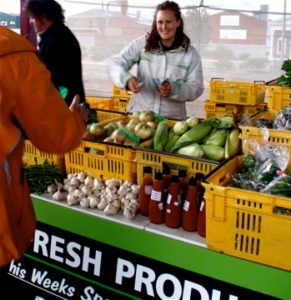 One of my favourite stalls at the Otago Farmers’ Market is that of Brydone Organic Growers. Their range of robust, deeply colourful, beautifully formed vegetables is a delight to the eye and the tastebuds, and proof of the consistently high quality organic produce can achieve. Brydone Growers, on State Highway 1 a few kilometres south of Oamaru, has a long history of production. It was originally part of one of Otago’s earliest farms, the 16,000-acre Totara Estate established in the 1850s. Later, owned by a Glasgow-based land company and under the skilled management of Thomas Brydone (commemorated by a nearby hilltop monument and in the property’s name), the estate became renowned for the quality and output of its wool, cattle and grain. When the wool market collapsed, Totara diversified, becoming in 1882 the first provider of sheep carcasses for the new frozen meat trade out of Port Chalmers to Britain, a trade that influenced subsequent agricultural and grassland expansion in New Zealand.1 In the late nineteenth century the estate was broken up into smaller holdings. Many, like Brydone, later became part of the area’s market garden landscape. A similar spirit and motivation inspired current owners Marty Quennell and Cushla Brophy in their purchase of Brydone Growers in July 2008. Moving south from Rangitikei to take on a large intensive operation was a brave move for a couple with minimal horticultural experience, but a measure of their confidence in its viability – and their own passion – is the recent purchase of an adjoining 21 hectares, doubling Brydone’s capacity for diversified organic production. Cushla, who tends to be the ideas person behind Brydone’s current activity, grew up on a conventional sheep, beef and cropping farm in the lower North Island. Later, as a keen home gardener and increasingly concerned about making the best choices for her young family (Lucas, now 12, and Daniel, 10) she came to “live and breathe the organic philosophy”. Coincidentally, her commitment led to the first contact with distant Brydone Growers Organic Farmshop: after a vain search in the North Island one Christmas for an organic ham, she saw the Smiths advertising just the thing. She was impressed with their service and product – a ham tastier and more tender than any she’d eaten before – but never imagined where the connection would lead. Marty had done twenty years in the construction industry, and was, he jokes, feeling that it was “time to rest”. Farming appealed to them both; their vision was for an organic sheep and beef property, but dairying and farm conversions were taking off in their area, and land prices with them, beyond their reach. They’d never considered market gardening until friends who had moved south saw Brydone advertised for sale and urged Marty and Cushla to take a look. They came, fell in love with the landscape of gentle downs and limestone outcrops, recognised the uniqueness of the property and its potential, assessed their skills and priorities – and bought. The couple are full of praise for the Smiths, who have continued to give generous support on everything from certification requirements, to planting schedules, to entry into the network of relationships they had established in the local and organic communities. Cushla and Marty were also delighted that core staff stayed on, as their commitment, expertise and specific knowledge of the property has proved invaluable. Davey Robbins, working with four others harvesting onions the day I visited, said he “couldn’t go back” to conventional growing with its heavy chemical inputs. Foreman Nigel Clarke, who in ten years at Brydone Growers has gained intimate knowledge of the property, says the work is “never repetitive, always a challenge in finding different, better ways to do things … results at the end of the day are satisfying” – enough to have him, after a week in the fields, up at 4 am every Saturday to load veges, drive an hour to Dunedin and work several more at the stall at the Otago Farmers’ Market. Brydone Growers produces a broad spectrum of crops. 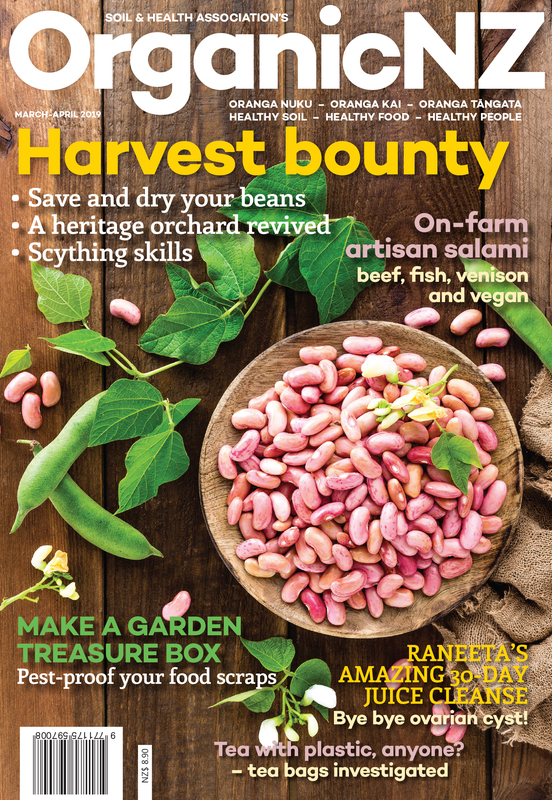 The current harvest is a veritable cornucopia: red and white onions, sweet corn, silverbeet, lettuces, zucchini, celery, carrots, beetroot, fennel, radishes, turnips, tomatoes, capsicums, and a range of brassicas – caulis, broccoli, cabbages, cavolo nero. The property’s main output, however, is potatoes – around 50 tonnes a year. 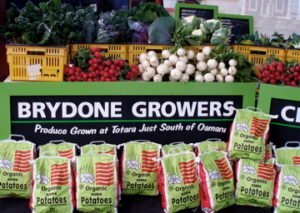 The area’s soil and climate are ideal for early potatoes, and Brydone’s distinctive green boxes of delicious baby Jersey Bennes can be found as far afield as Auckland supermarkets, in plenty of time for Christmas. Later main crop potatoes include Agria, Red King, Desiree and Nadine, all grown from certified untreated seed potatoes suppliers such as Christchurch’s Alex MacDonald. Aside from their staff, the secret of Brydone Growers’ high productivity, Marty says, is in the soil. 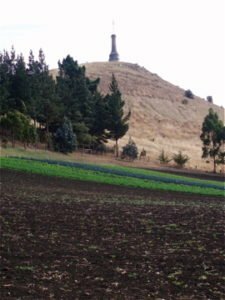 While the Oamaru hinterland is renowned for its limestone, the Kakanui and Waiareka areas also have rich volcanic soils, deep well-structured loamy topsoils associated with weathered basalts. Known locally as ‘Totara tar’, it’s heavy and sticky when wet, forming distinctive heavy chunky nuggets when ploughed. Left to weather in sun and rain, however, it requires little more cultivation to transform it to a fine tilth ready for planting. They are also fortunate to have plentiful bore water, drawn from the extensive Deborah aquifier, so are able to irrigate when necessary. Marty has continued the regular use of compost teas, an experiment begun and refined by the Smiths, to help maintain the soil’s fertility and biological activity. Water, seaweed, vermicast (for bacteria) wood bark chips (which provide fungi), high quality compost from Chaos Springs, humic acid, crushed seashells (for lime), protozoa (from fermented hay), and molasses are mixed then mechanically aerated in a 1200 litre tank for at least 24 hours. The tea is further diluted 1:3 with water and sprayed monthly over the whole farm. 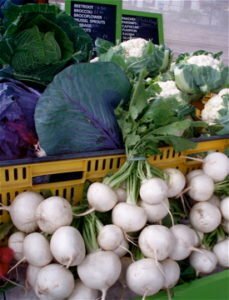 They practise a four crop rotation, alternating new and main crop potatoes, brassicas, and other leafy and root vegetables, and including green manure crops like buckwheat and phacelia in the cycle to contribute nitrogen and other essential elements. Once the crop is ploughed in, land is left fallow over winter, and requires only a light cultivation before spring planting. They also have pasture sown with a herbal ley mix; a few sheep and a small mixed breed herd of Angus/Friesian/Highland cattle grazing here contribute to Brydone’s fertility and later to its diverse production when slaughtered for the family’s own consumption and for the freezers in the on-farm shop. 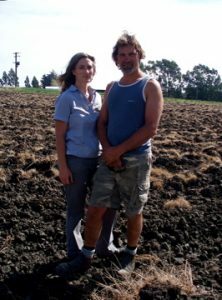 Crop diversity and interplanting helps further minimise exhaustion of soil nutrients, as well as preventing the spread of pests and diseases – which are minimal, say the couple, compared to their growing experiences in the North Island. When necessary, a seaweed and fish oil spray is used against caterpillars and aphids, especially on susceptible brassicas, and planting phacelia helps keep carrot fly at bay, as does intercropping with onions. This year Marty used tethered blackbird kites to stop flocks of birds from ravaging tender silverbeet; real hawks managed the problem of hares, which showed an unfortunate predilection for young broccoli! Intensive organic production does require labour. While a tractor-drawn grubber keeps control of weeds between rows, hand weeding and hoeing is also necessary when seedlings are small. During the intensive growing and harvesting season an extra dozen or so people supplement the core of six year-round staff. Daniel and Lucas help out too, gaining valuable experience and pocket money along the way. Brydone Growers has several outlets for its produce. A big volume (especially potatoes) goes to organic wholesaler, Fresh Direct, which packages and distributes much of it through its ‘Pure Fresh’ label, mainly through supermarkets. Dunedin’s organic retailer Taste Nature also stocks some Brydone produce. Otherwise, it’s direct selling through farmers’ markets and their own on-site shop. Handily positioned right on Brydone’s main road boundary, the shop was an abandoned community hall that the Smiths, with input from sister-in-law Cathy Watts, revamped into a one-stop organic outlet. Cathy still has a key role there. There’s a comprehensive range of grains, flours, meat and dairy products, takeaway coffee, baked goods, wine and beer, seeds, cosmetics, household products and bagged compost. The shop fills another role. It concerns Cushla that many people don’t understand where their food comes from, and that there’s still ignorance about the value of organic food. Here, the connection between market garden activities on the slopes behind and the food for sale is clear. She hopes that demonstrating a non-elite approach to organics, and options for a healthy lifestyle, will help make people more conscious of the possibilities. The couple are keen to keep developing Brydone. Cushla, an avid reader and researcher, feeds ideas through to Marty and Nigel, who are, she says, incredibly open to putting new suggestions into practice. They’re interested in trying various cereal crops. A recent experiment with barley wasn’t too successful, but NZ Biograins have given encouragement and helpful advice. They’re enthusiastic about biodynamics, and would like to incorporate this. The couple see potential for greater self-sufficiency: saving their own seed, even producing their own biofuels; but Marty is clear that they need to work out their priorities and stick to them. Currently, one of his is perfecting bulk composting, using all their waste vegetation. Dr Annie Stuart is an historian and researcher with broad interests in sustainable food production and resource use, and practical experience in organic gardening from Stewart Island to Northland.